Soda Ash is the term used to describe sodium carbonate. This sodium salt, a derivative of carbonic acid, is a common ingredient used to manufacture paper, powdered soaps and glass. Its purpose is to raise the alkaline level. Soda ash is also used to elevate total alkaline levels and soften the water found in swimming pools and spas by slightly raising the pH levels in the water. Large industrial manufacturers that use soda ash have local and state guidelines to follow regarding its disposal. When using soda ash in your home, yard or classroom, it is important that you dispose of it appropriately, in a safe and effective manner. 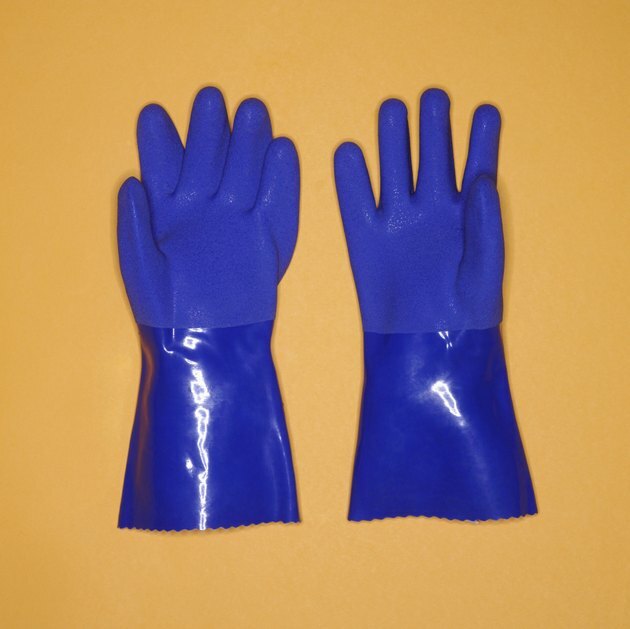 Wear protective gloves when working with or disposing of soda ash to prevent skin irritation. Be careful not to let soda ash splash into your eyes during disposal to avoid eye irritation. Refrain from breathing in soda ash dust, vapors or mist during disposal to avoid irritation of the respiratory tract. Consider wearing a protective breathing mask. Place small amounts of soda ash that have already been dissolved with water into your sink. Run the warm water to flush the soda ash down the drain. Avoid pouring large amounts of soda ash down the drain, as the high level of pH that is found in large amounts may damage the septic line. Neutralize the pH of the soda ash by mixing it with vinegar. Test the pH of the soda ash and vinegar mixture with a strip of pH paper. Achieve a neutral pH of 7 on the pH paper. Pour the solution down the drain. Flush the soda ash down the drain with warm water. Avoid pouring the solution onto any plants or bushes, as the high amount of salt that forms when soda ash is mixed with vinegar can be damaging to plants. Avoid disposing of soda ash near lakes, rivers, streams or oceans, as it is toxic to fish and aquatic life.